When the biggest highlight in your life has been your weekly bridge night with the “girls”, what do you do when one of your foursome inconveniently dies? 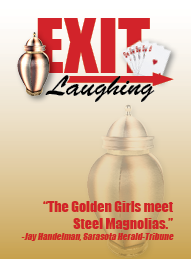 If you’re Connie, Leona and Millie, three southern ladies from Birmingham, you “borrow” the ashes from the funeral home for one last card game and the resulting wild, exciting night involves a police raid, a stripper and a whole new way of looking at all the fun you can have when you’re truly living. Connie Harland (50’s – 60’s) – Responsible, strong and stable. Mother of Rachel, who finds on this fateful bridge night that life doesn’t end at after 50. Leona (50’s – 60’s) – Fun and quick witted. One of Connie’s closest friends and a member of the bridge club for over 30 years. A woman who’s a beautician by profession and a rather caustic lush by preference. Millie (50’s – 60’s) – Innocent and good natured. Another of Connie’s friends and a long-standing member of the bridge club. This is a woman who moves to her own special drummer, even though she’s the only one who can hear him. Bobby / Policeman(20’s) – Intelligent, good looking and must be comfortable performing a strip tease. All interested actors should prepare a 1 to 2-minute monologue, either dramatic or comedic.